Monsignor Panke, a priest of the Archdiocese of Washington, is the Rector of the Saint John Paul II Seminary in Washington, DC. 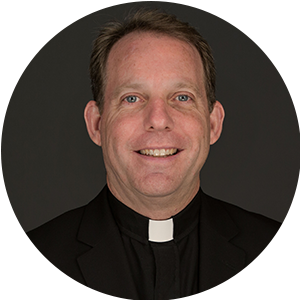 He is also the Director of Clergy Formation for the Archdiocese of Washington and oversees the formation for seminarians, the continuing formation for priests, and the formation for candidates to the permanent diaconate. Msgr. Panke also served as Director of Priest Vocations and Formation for the Archdiocese of Washington for nine years. Prior to his work in vocations, he served as Parochial Vicar at St. Peter’s in Olney, MD and was the Chaplain of the Newman Center for George Washington University. Msgr. Panke earned his Licentiate in Spiritual Theology from the Pontifical University of St. Thomas Aquinas in Rome after receiving his B.A. in Financial Management from The Catholic University of America. Monsignor Panke has served as an Archdiocesan Consultor, as President of the National Conference of Diocesan Vocation Directors and as a member of several boards and councils including the Institute for Priestly Formation.